If we were to look at the way a vast majority of people travel, we may well find that those who opt to make a journey do so without giving it much thought. Many people today simply like to book their tickets, choose some nice looking accommodation and venture to a destination that looks fairly interesting. They then fly there, Take some local tours, eat local food, take pictures of certain things they like (or potentially feel they should have pictures of) and go home. This is not to say that this means of travel is at all wrong in any way, but Brown + Hudson can’t help but feel that travel can exude so much more, going beyond those standard places of travel into the unknown truly will be a journey to unknown lands and will most certainly “ shake off” the “fetters of habit”. In turn we feel that this could allow more room for a deeper level of thinking and a deeper appreciation for the vastness of the earth and our place within it. Travel, is a basic human desire….we are a migratory species and often like to put some distance between ourselves and everything we know. The Kerguelen Islands in the Southern Indian Ocean. This set of Islands are some of the most remote archipelagos in the world. In our minds the Kerguelen Islands are the best kept-secret in exotic travel circles. The islands are part of the French Southern and Antarctic lands and are some of the most isolated places on earth. Sitting more than 3300km away from the nearest civilised they sit over 2,000 miles away from anyone else. With no available airport here one travels to the island from Madagascar on a six day boat ride leaving from Reunion, a small island located off the coast of Madagascar. It should be taken on board that the surrounding seas around the Kerguelen Islands are pretty rough, so six days on the open Indian Ocean is not for the faint of heart, but then neither is the location as such. The islands are currently only inhabited by scientists and this may be down to the fact that it holds many different species of mammals such as whales and fur seals. Our second remote recommendation would have to be Easter Island. 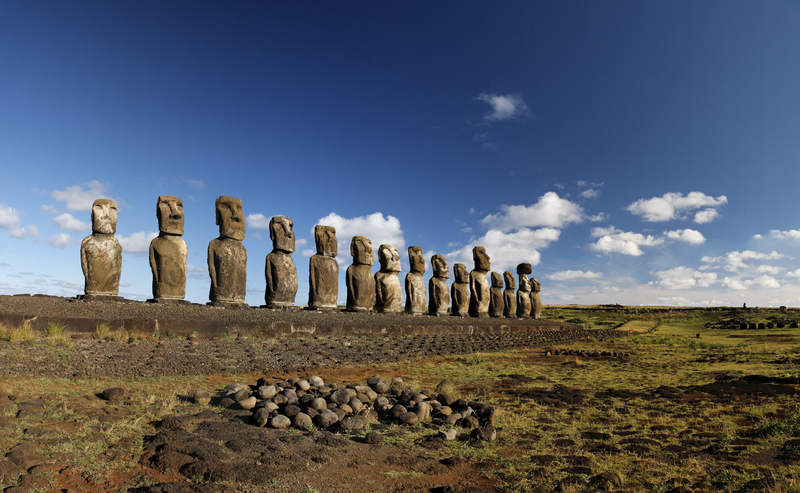 One of the most isolated places on earth, this tiny speck of land holds an extraordinary collection of archaeological sites, including the iconic moai, sitting amongst a somewhat eerie landscape. This island is absolutely perfect for those who love culture and adventure. Sitting more than 1,200 miles away from the closest inhabited island and 2,180 miles from Chile, the nearest large land mass this is another Brown + Hudson favourite for a remote adventure to lands unknown. The island is 15.3 miles by 7.6 miles and has at least 4,000 residents. Polynesians are believed to have been the island’s first inhabitants, arriving sometime between 300 and 1200 BC. The inhabitants here have developed their own culture and religion, away from the rest of the world but this does not make them unaccustomed to people or to welcoming you to their land. They’re some of the friendliest people you’ll ever meet and the landscape is truly awe inspiring. Here you will encounter vast Volcanic craters, intriguing lava formations, stunning beaches, magnificent turquoise waters and fascinating archaeological sites, making this a truly beautiful remote escape. Our final suggestion for a remote escape would have to be Cape York Peninsula. This vast remote region is spectacularly beautiful. Consisting of a landscape of contrasts and surprises, this remote land will be sure to amaze. It is a nature lover’s paradise with over 3000 plant species and 321 bird species inhabiting over 14 million hectares, and the rock art galleries of the Cape have been rated amongst the Top 10 most significant art sites in the world. Cape York has been described as one of Australia’s last great wilderness.’ From the Gulf of Carpentaria in the west to the Coral Sea in the east, untouched coastline, wild rivers, animals, culture and characters thrive across this colossal cape. Today the peninsula has a population of only about 18,000, of which a large percentage (60 %) are Aborigines and Torres Strait Islanders. Vibrant and diverse, this region offers opportunities to absorb and connect with the ancient rhythms of this ancient land and people. As I sit recalling my most revered encounters of the unknown I couldn’t help but think back to Jon Hope Frankin’s way of thinking as he said “We must go beyond textbooks, go out into the by paths and untrodden depths of the wilderness and travel and explore and tell the world the glories of our journey.” Perhaps this ethos will get you thinking about your next adventure and the endless possibilities for exploration across the world, right at your fingertips. We are experts in travel with extensive knowledge about the earth and its hidden wonders, so if you are not yet sure which remote island or land you want to explore, why not talk to one of our specialists who will help to discover where may be best suited to you and your needs. If you would like to plan your next adventure contact one of our specialists in our London office on +44 203 358 0110 or email.